I don't have a card made for today (a long day putting the house back in order after vacation and a clingy toddler didn't leave me much crafting time!) so I thought I would share the invitations and pictures from Bree's flamingo birthday party back at the beginning of September. 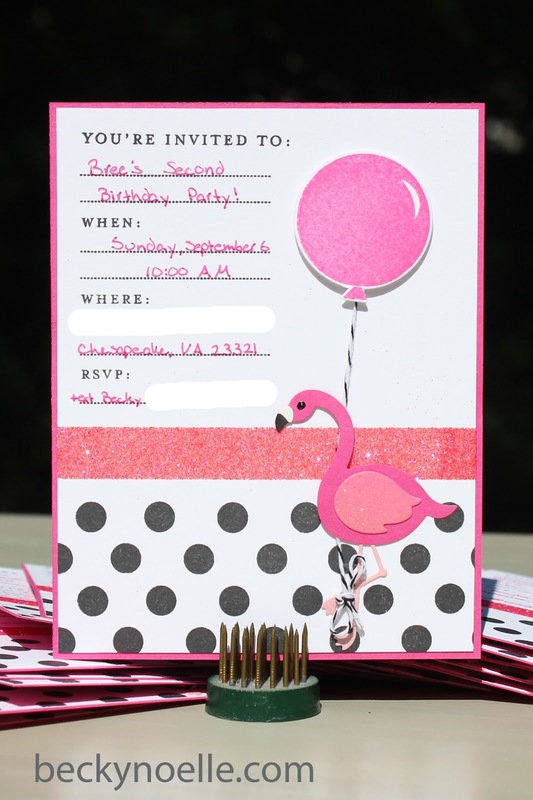 I used the adorable flamingo die from My Favorite Things pieced together and paired with some Papertrey Ink stamps for the invitations. Bree had so much fun with the balloons! We had planned to tie them to the flamingos outside in the yard - but it rained most of the day so we never put them outside and Bree loved them. It was kind of like having the green diamond over your character in the Sims - you could always know exactly where Bree was in the house by spotting the tower of balloons! My bedroom looked like the aftermath of a drunken stuffed animal party by the end of the day. anyways, that was Bree's party! I'll be back tomorrow with a card (I get to go to the FedEx office and pick up my new My Favorite Things order today! yay!) Have a great day! P.S. Enabler alert! Today is the release day for Mama Elephant, Papertrey Ink, and Simon Says Stamp. Happy shopping! Papertrey Ink October Blog Hop! Creeping By Card and VIDEO!! !